If the name Francesco Cameli conjures up the idea of an Italian violin maestro, then you wouldn’t be that far off reality. Francesco ‘Franc’ Cameli’s route into music started off in Italy by having a violin thrust into his hands at the age of 4. This all seems a far cry from Franc the established rock engineer with a long list of credits to his name. So what happened? “Much to my parents disgust, it had gone from me playing violin all day in the house to me bashing the drums all day. It’s funny because years later I actually got to record Nicko from Iron Maiden at my studio Sphere in London! I still listen to all the classical stuff. So I did that for a few years and then picked up the electric bass when I was about seventeen, went off to America, went to Berklie, studied electric bass, came back, started playing sessions for people and found interest in watching the man at this big table of knobs pressing stuff and all the band mates were kind of sitting there going "oh he's been noodling for half an hour, I can't hear the bloody difference" and I was the one sat at the back of the room going "no, that's really cool, I can hear what he's doing" and would migrate to sit next to these people that were sort of playing with faders and buttons. And that's how I fell into being in studios - from playing in them to being fascinated by what engineers did, to having a go myself, to becoming obsessed with everything engineering, and then building a small studio until I decided that I wanted to build something utterly obnoxious. So then I built Sphere. That was fifteen years ago now." You use the word "obsession". It seems to kind of summarise you in a way because everything you've ever done, you've always wanted to do it right, like looking at your racks, looking at your studio, it's not that you don't suffer fools gladly, that kind of extends to everything in life in a way, it's either right or not at all for you. Is that a good summary? Do you think it's money and budgets or do you think it's technology? "Do you honestly think that trying to save money by going fast is actually going to save you money in the long-run?" Do you think that's a lie in the industry? "That's where I see the correlation." Do you think it's a convenient excuse for people not doing it right? "I don't think it's a convenient excuse. Budgets are what they are these days and I understand that. I think it's a misconception people have because actually there isn't a plug-in out there that will replace kick drums reliably and quickly so inevitably, if you want it done properly, you end up laying every single kick drum sample in by hand and phase lining it to within a sample of where it should be which takes a long time so it takes fifteen, twenty minutes, half an hour to lay in a pop track's worth of kick drums properly and that's before you even get into double bass drums and fast metal grooves where it can take an obscene amount of time. In these cases, I often end of up saying "hang on, I've just wasted an hour". Why couldn't I spend five minutes maybe adding a mic to the kick drum and just tuning it slightly differently or whatever to achieve 90% of what's there to the point where you're not going to go "well they're still going to stick a sample in because actually this kick drum sounds really good and I can get it to do what I need it to do without having to do that."" It sounds like it's not because you're a luddite, it sounds like you like the options but you don't want them to be a necessity. "You might say "oh let's try that snare sample", not because you've messed up the snare in the first place, but because you just want to try it. 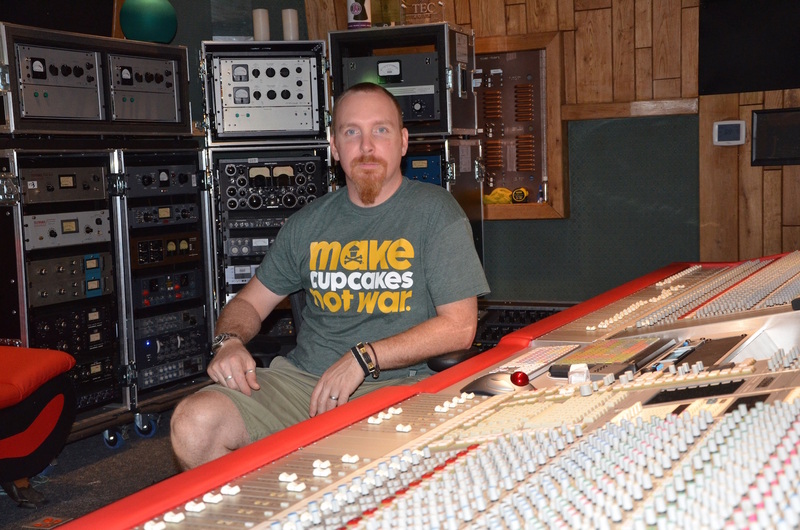 I see myself more as a tracking engineer than a mix engineer." Which is probably where that philosophy comes from. You don't want to hand somebody a bad session to mix? You almost want to give them something to balance and it's almost there already? "Correct. A lot of friends and colleagues are mix engineers and they're forever complaining going "oh god, I got this multi-track the other day and I spent ten hours noodling with it before I could even start mixing" and that to me is just horrible. I've mixed stuff and I've been in that position, and at some point I'll do a lot more mixing than I am at the moment but I actually really enjoy the tracking process. I want to be able to hand a mixer I respect and whose work I love, a multi-track where they can go "oh bliss", and just put it up on their DAW or on their mixing console and just get on with it. Then when they've finished they go "oh that was easy". More often than not, it comes back sounding amazing and you don't get that disappointment that you sometimes get when you send off some multi-tracks to people. You get the mix back and you kind of scratch your head and go "what happened?"" So name some artists you've been working with recently. "Most recently - the likes of Stone Sour, Steel Panther, Animals As Leaders, Keith Urban and Toto. A nice and diverse roster of extremely talented people." Let’s move on to vocals. So you're not using vocal processing to enhance a bad performance, you're using it to almost polish great vocals and not make up for their deficiencies? With all this said it seems surprising that you use Revoice Pro. What does it bring to the process? "It saves an obscene amount of time that used to be spent. I mean, before you would tune absolutely every part of every take that needed help, which would take a long time and then I would manually move syllables around to make them fit with each other. Then I would take my time expansion or compression plug-in of choice and lengthen any syllables that I couldn't get to fit back into a word because I'd maybe had to move them around a bit too much. That would take hours and hours, so to be able to now pretty much hit a button and go "track this, I like this - now make this double follow this" or go "ok, I don't want it to nuke it that hard so I can turn this down a little bit but I want the timing to be reasonably tight but not too much and the tuning to be here" and then you can just audition it and go "well that sounds great” is amazing! Or "maybe I can get away with a bit more, that's a bit too much". It's so quick, simple and easy, so now we can move on and get on with another creative part of making hopefully a great song at the end of it, rather than "let's get bogged down in all this editing again for the next thirty hours of our lives" while the client falls asleep and the producer's tearing his hair out in disbelief." What other parts of Revoice Pro do you like? So like a stereo double? "I find the doubling sound, where I can create a double of a vocal and sit it under a track and blend it in, rather than just have a stereo double. You've got a stereo double and you've got your single in the middle but I don't like vocals to be stereo all the time. I like to push them in and out, almost like a swell at times." Franc is one of a rare breed in the modern recording industry who strives for excellence and yet he does not confuse it with perfection. That’s perhaps the difference between art and science, knowing that the subtle deviations of a performance can create magic. We are thrilled that Synchro Arts products help him to maintain excellence without destroying that magic. Cameli and his team are in the process of setting up Sphere in LA. Sphere was originally based in London and hosted a slew of big name artists over its 13 years of operation including Queen, Genesis, Eric Clapton, Elton John, Mariah Carey and Muse. Adele’s world-beating 21 album was also recorded at the facility. Read more about Sphere Studios here.